I woke to this dream this morning: Someone was talking about how being an accordion player was who they truly were. They were adamant. While they were other things as well, playing the accordion was at the core of their being. I don’t remember much else, but then I looked at the clock and it was 5:55 am. Some folks take a time like that (all the same number) as a message from the ‘other than human world’ to PAY ATTENTION! The thing that stuck with me about this dream was the conviction the person expressed when claiming who they were. The way I see it, we are each born with gifts, things at the core of our being that are our true essence. Our job in this life is to find, figure out, or connect with those gifts and share them with the world. No small or easy task for most of us. One of my biggest challenges is the sharing part. 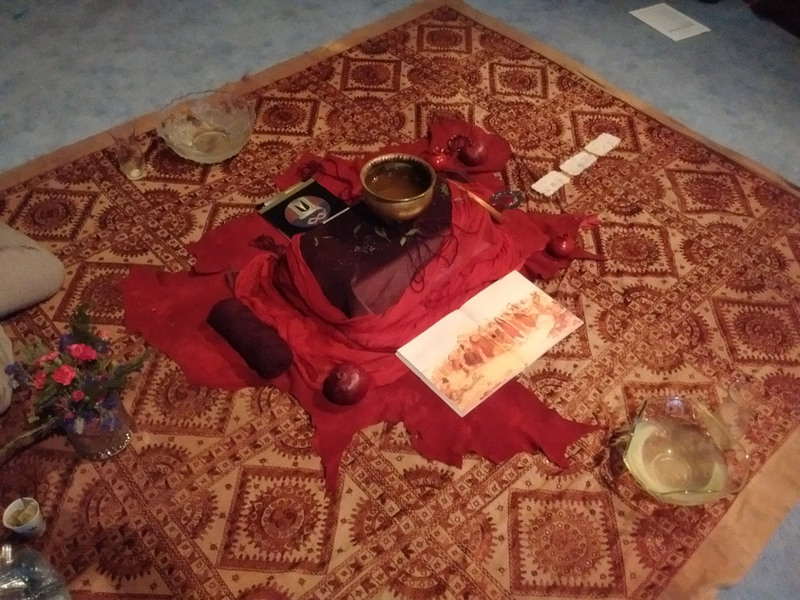 I create and tend to Sacred Space, I am a Tzovah* or temple keeper. I create opportunities and spaces to share my knowledge, I am a teacher. 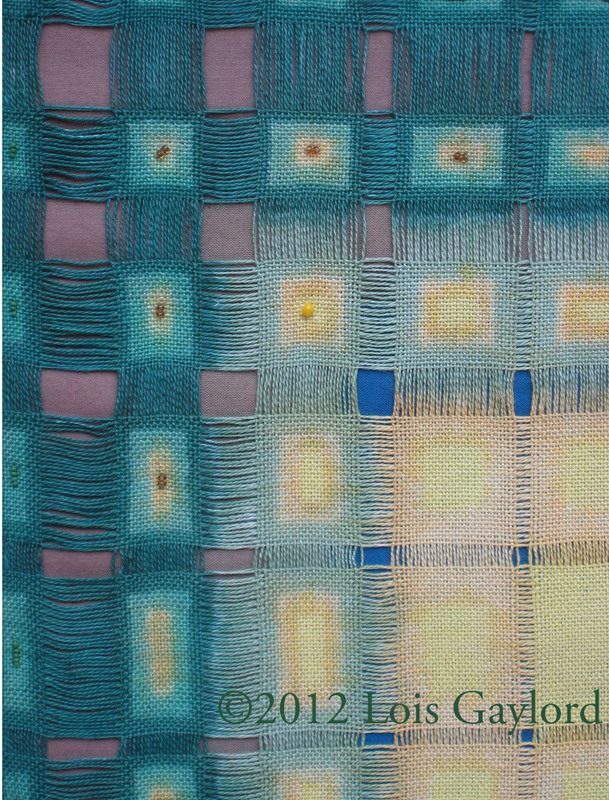 I create beautiful cloth that helps people connect to Source within themselves and with all, I am an artist. I seek out connections between all things to Weave Oneness, I am an Oreget* a weaver. *Tzovah and Oreget are 2 of the 13 Kohenet Priestess pathways. 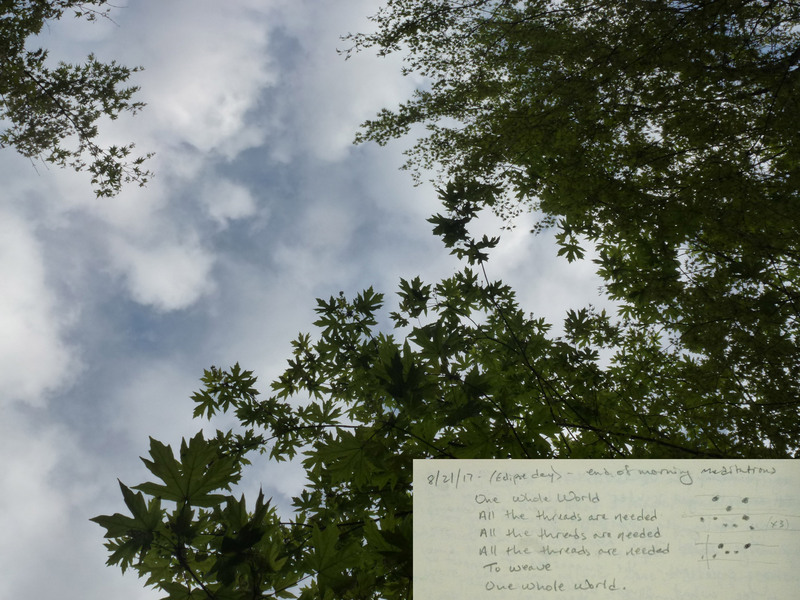 This came to me as a song last summer on the morning of the Solar Eclipse, the photo is from one of my journals. The sky photo was taken earlier this afternoon (5/3/18). Wanted to share this in honor of Beltane / May Day. Happy Spring! Having spent most of my life hiding from myself and/or the world, posting on this blog is a big step for me. I’ve been searching most of my adult life for meaning, connection and trying to figure out what my purpose is during this lifetime. In my 20’s I began meditating, and was a disciple of Sri Chinmoy for a short while. That was followed reading by a lot of books on a variety of mostly New Age subjects. Then about 10 years ago, I started studying Wicca as well as going back to my Jewish roots and discovering that there were more similarities than differences between the two. 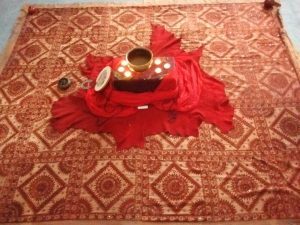 During this time I became involved with the Women’s Torah Project and was looking for a deeper connection with the Divine Feminine. My reading now included anything I could find on Shekhinah. 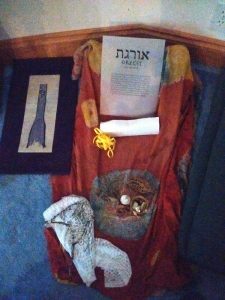 In the Fall of 2015, I stumbled upon the Kohenet Hebrew Priestess Training Program. It is described as ‘Earth Based, Embodied, Feminist, Judaism. I sat and read every page on the website. When I got to the bottom of the page describing the 13 priestess paths I was blown away. One of the Paths is The Weaver. 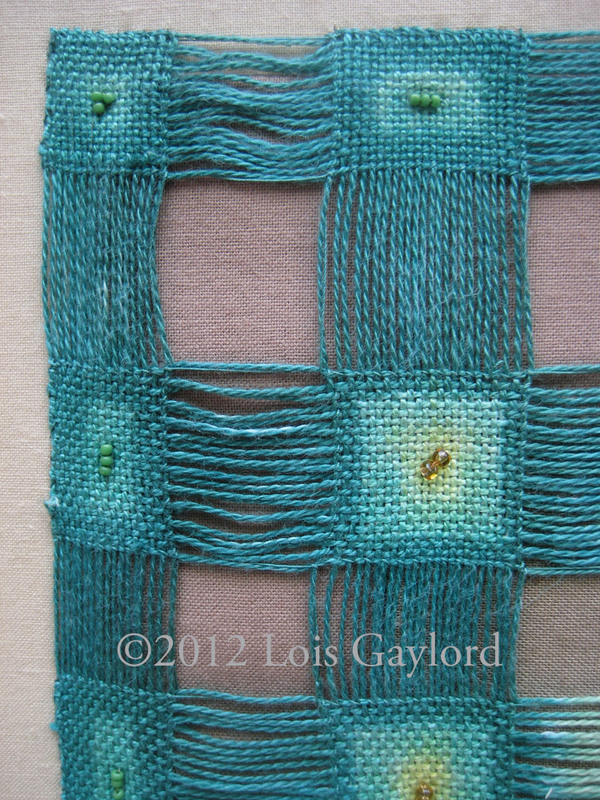 The Weaver weaves in the Temple to honor the Divine feminine. What she weaves are batim or “houses”—tapestries, garments, or maybe worlds. Like the Fates, the oreget weaves space, time, and soul together. She embodies the connectedness of all things. It is she who integrates and connects the many threads of the world. We see her in the women who spun the goats’ hair for the Tabernacle. Her gifts are the weaving of legends, interpretations, rituals and traditions, as well as weaving, sewing, writing, and all the creative arts. She watches over all activities that bring disparate elements together. My first thought was “I’m not crazy!” I was awed, humbled, thrilled, amazed, excited, blown away. My path was real, not some crazy thing I was dreaming up. They were describing me. Some of the ideas could have been taken from my artist statement. And literally, I am a weaver. I promptly signed up for their newsletter, and in a few months, they announced they were taking applications for two new cohorts, one on the East Coast, and one on the West Coast. I finally got my application in, and was accepted. I went to the first week of training in January 2017 still not entirely sure about this, it sounded so cool, but what in the world would I do with this? By the middle of the first full day, heading to the dining hall I knew, “I’m home”. Central altar at the end of the week for Shabbat. Happy Jewish New Year everyone. Detail of Path to Avodat ha’Lev, the Work of the Heart. My wish for the new moon, new month and new year: May it bring Peace, Prosperity, and Loving Relationships based in pure heart desire and intention for the highest good of all. And may we each find our way to the work of our hearts. Shana Tova (a good year) Blessings to all. It was the third and last quarter of the certificate program, and time to start on our final piece that would be in our class show. After the harsh critique of my last piece, I wanted to ‘redeem myself’ and make a better one. Rather than starting with a new concept, I decided to continue working with the same subject. The second result was way more successful in expressing the ideas I had. 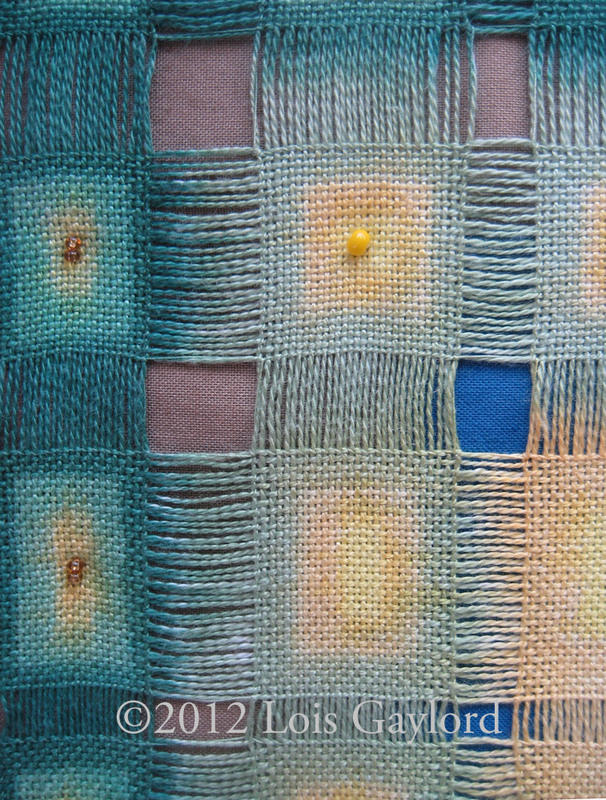 During my meditations prior to the first piece (along with the words “pulling the threads of spirit into our daily lives”) I saw the juxtaposition of two different types of textiles connected with threads or yarn. 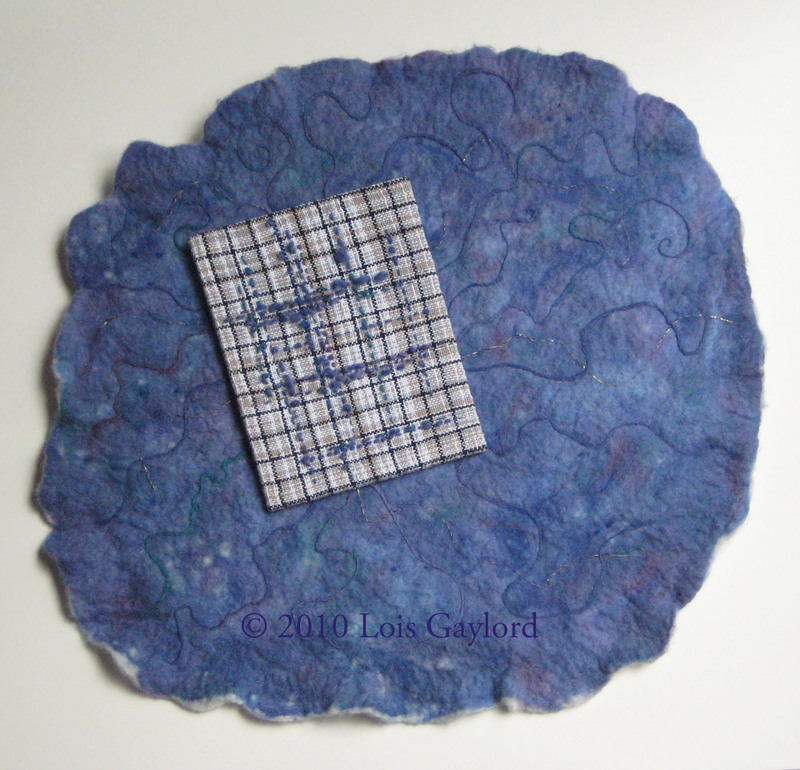 The felt would represent the spirit world that is often only sensed with an intuitive feeling. The woven piece, with it’s gridded pattern, would illustrate the regulated structures of daily life and the human penchant for categorizing and labeling everything. 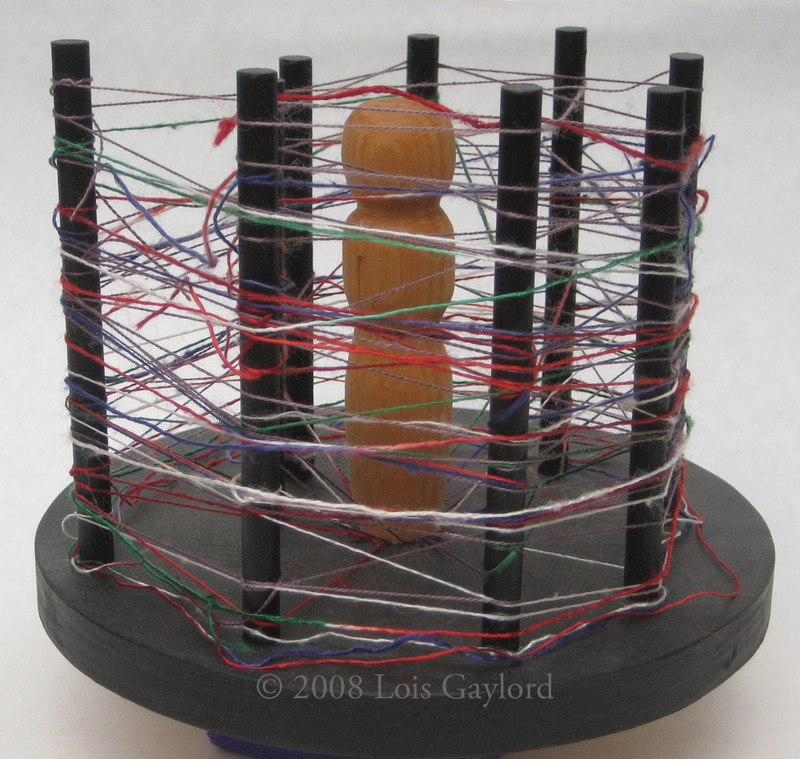 Adding the connecting threads would open the possibility to begin merging the two worlds. One of my goals for the certificate program was to find a focus for my work. While working on this piece I realized that I had found it. A lot of artists focus on a specific technique and/or subject matter. For me it’s the concept and ideas behind the piece not the technique that is my focus. 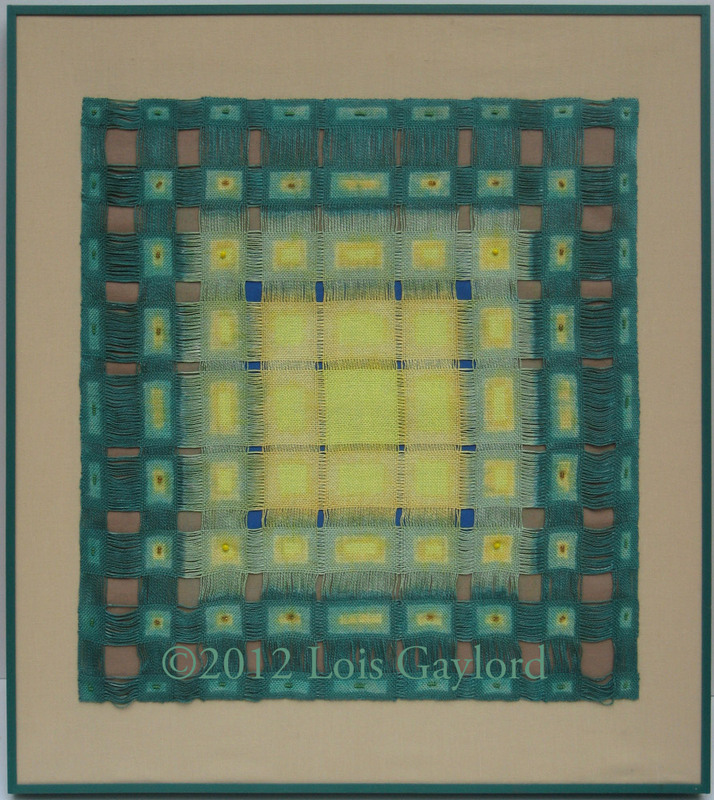 And overall, it is the Spiritual aspect that has become the primary focus for my work. This piece is the second in what will eventually be a triptych. The third piece will be “The Spiritual Life”. Looking back, these pieces were representative of my own journey. I needed to make “…Awakening to Spirit” first, as it reflected my past. When I made “Pulling Spirit…” it showed where I was on my path at that time. I started to prep the fleece for the base of the third piece, but that’s as far as I’ve gotten on it. The compelling need to work on it again hasn’t happened yet. I’m still pulling those threads of Spirit into my daily life. When it’s time, I’ll make that third piece. It was the beginning of March 2010 and the end of the second quarter of the certificate program. 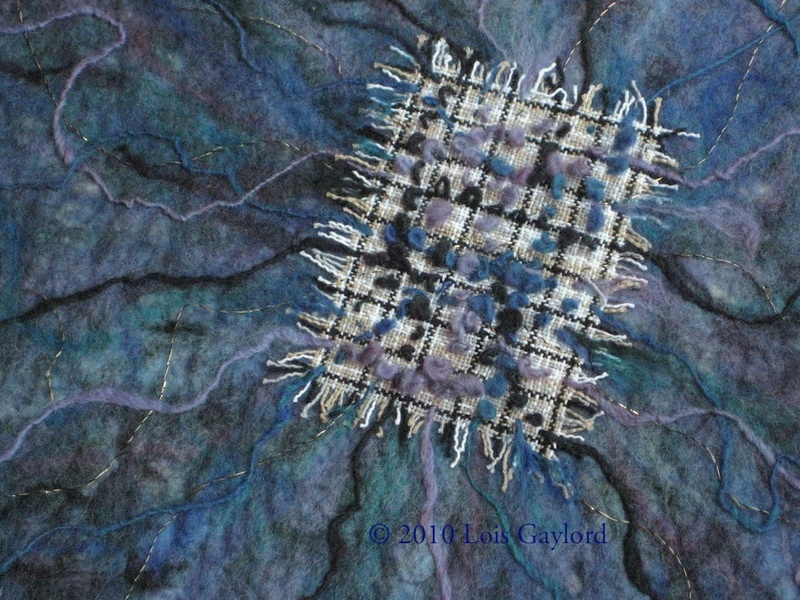 The major focus for the quarter was “Conceptual Strategies in Fiber Art” and looking at the creative process in general, and our own process in particular. Towards the end of the quarter, we were to reflect on an old piece, and use it as a springboard for a new piece, our final piece for the quarter. 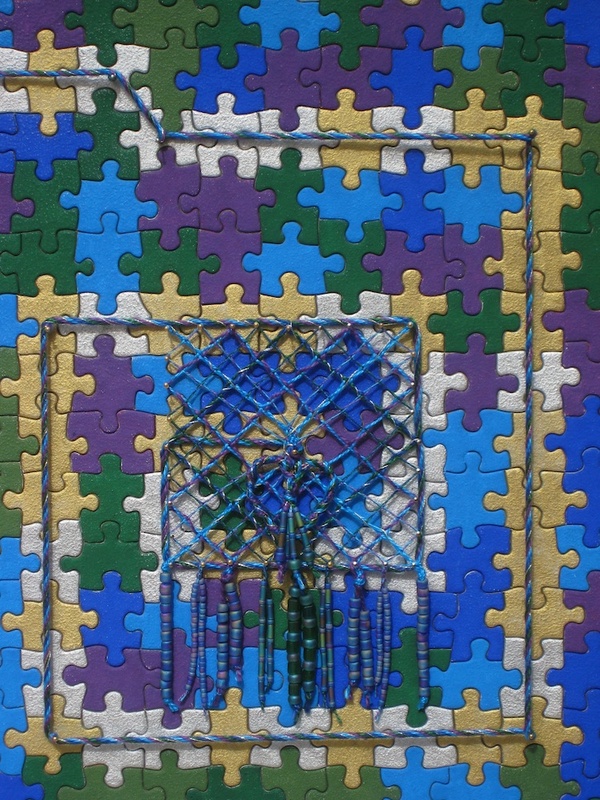 Since I couldn’t decide which piece to reflect on, I looked at two pieces, “Shamanic Connections” and “Finding the Patterns in the Puzzle of Life”. Working from those pieces and another idea that I got during meditation, I started on my piece “Pulling the Threads of Spirit into our Daily Lives”. I finished the piece the night before class, mounted it the next morning, wrote the reflection on it in the afternoon, and headed to class that evening. For those of you reading this that have taken art classes, and have turned in work for critiques, you know what a challenging experience they can sometimes be. I had one of “those” critiques that night. In class we were asked to say whatever we wanted to about the work. I felt unprepared, and unsure of what to say. I started rambling on about unimportant details, because I couldn’t bring myself to talk about my personal angst issues which was what I had been thinking and writing about in my original reflection. Back to the critique that night, the one positive comment I remember is someone liked the fact that I used a rectangle instead of a square which had been part of my original design. The one that really got to me was the instructors question and comment: “Is that blue blobby thing supposed to represent spirit?” to which I said yes, and he replied “It’s not really working for me”. Right… now what. So that night after class I stayed up very late, and thought a lot more about the piece. So once I had gotten done “wallowing in my emotional stuff”, I was able to look at and think about the work itself. I liked the piece and it felt right when I was done, but there was something bugging me about it as well and I was unsure what it was. The piece didn’t say what I had intended, so in that sense it didn’t work. 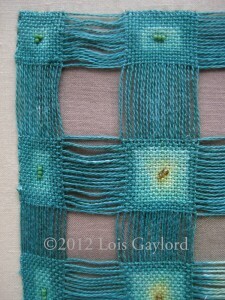 Visually, the woven part looked “plopped” down, and didn’t relate to the background. The felt background is very subtle and indistinct. Was it too plain? 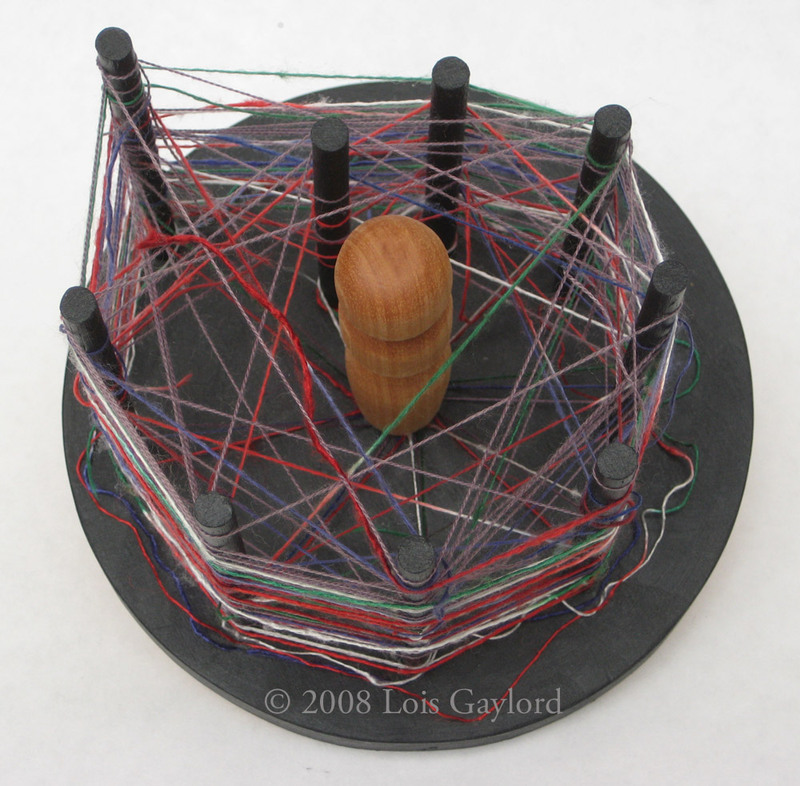 There wasn’t enough connection between the hand-spun yarn in the woven part and the felt background. 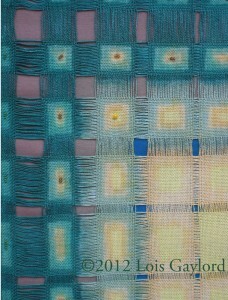 The woven portion dominated the piece visually while being smaller than the background. It felt uncomfortable, tentative and unresolved. It was very unbalanced. 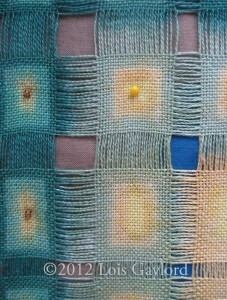 Dominating the piece is the woven portion representing daily life. It floats above the surface, removed and separate from the spirit world. The felt background resembles how spirit is viewed from this perspective. It is very hazy and indistinct. It’s unknown, you can only see things in that world if you look closely at it. 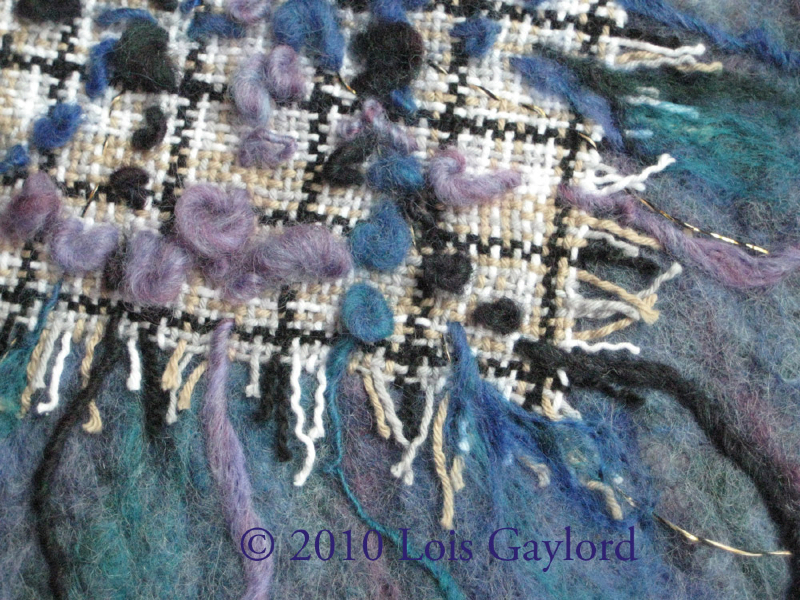 The hand-spun yarn becomes spirit beginning to weave itself into our daily life but only in places, a bit at a time. The piece feels disjointed and unbalanced because this can be a very disconcerting state. You know that something is not right, that things are changing, shifting, but what and how is not known. It requires an enormous amount of trust to reside in this place and even more to continue on the journey to discover and embrace Spirit. The next quarter I did a second piece, the one I had intended to make, “Pulling Spirit into Daily Life”, which will be the next post in my Art Story. This post is about beginnings. The birth of the idea Ceremonial cloths. My first piece of conceptual art made after a break of 20 years. A new understanding of my process. And the introduction to my story as told through my art. The next five years were very busy on a personal level, which included my father dying, moving and joining Kadima in 2005 to start our son’s Jewish education to prepare him for his bar mitzvah. 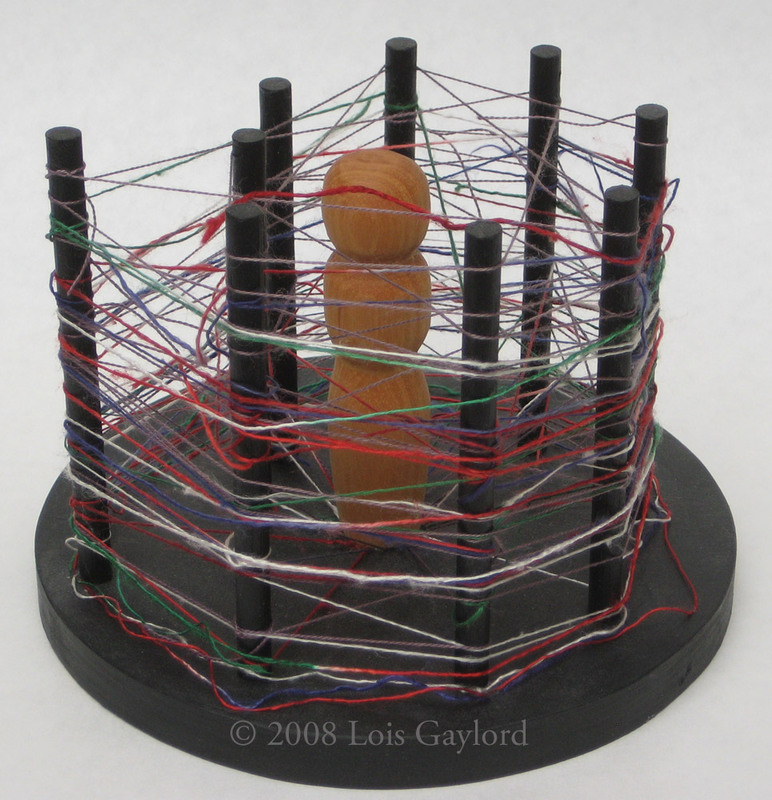 And finally on December 11, 2008 I finished my first piece of conceptual art in almost 20 years. It just so happens that I’m writing this on December 11, 2012. Another ‘interesting coincidence’? 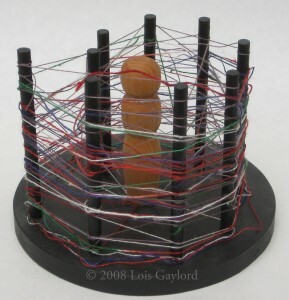 This small sculpture features a female figure in the center of a spiral of small dowels. 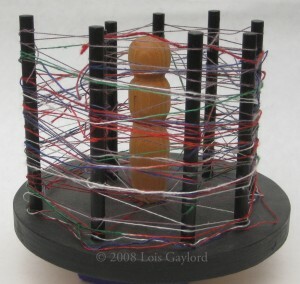 The threads coming out of her ‘feet’ swirl around her but don’t touch her. That’s partly how I felt at the time. It was like I was caught in the middle of these swirling mists where nothing was tangible. There was nothing I could touch or get a hold of. I was trying to figure out what I wanted to do with my work. There were so many options and possibilities but it all felt so vague and out of reach. The only thing I knew was that it would be something to do with my art and spirituality. The ceremonial cloths seemed like an impossible dream hidden in the mists. “Homage to Eve ” was directly born out of my explorations of my spiritual path. Along with attending Jewish adult education classes at Kadima, I’ve been studying various Earth-based religious practices and traditions. When I made this piece I was in the middle of studying the Ogham, a system of knowledge from trees in the Celtic tradition. I was studying one tree a month, and that month the tree was Hazel which was about creativity. I had also recently received the book listen to her voice, Women of the Hebrew Bible, by Miki Raver. The challenge for that month of study was to create something in honor or in homage to to one of the Biblical matriarchs. I chose Eve. Her name means “Life -Giver” or “Mother-of-All-Who-Live”. “Eve was the first human to embody the divine process of creation.” (1) This piece gave birth to the renewal of my creativity and my art. Several years later, I finally woke up to the fact that this is part of my process, the way I figure things out. Being a visual thinker makes verbal communication a challenge at times. I will often get an image, perhaps a few words or a phrase to go with it. Then I start thinking of ways to create a 2 or 3-dimensional representation of it. Now that I am allowing myself to go ahead and create these pieces, I am learning from them. Sometimes ideas pop up while I’m working, but often I need to study the finished piece for a while before the meaning(s) would become clear. And sometimes a piece will continue to tell me things as time goes on. This piece is a good example of that. It wasn’t until I was writing this post that I realized something very significant. When I made this piece, I knew I hadn’t been making art for a very long time, but I hadn’t realized how long, and I certainly wasn’t expecting this piece to open the door to creating again. So the fact that I chose Eve, “The-Mother-of-All-Who-Live” as the subject for a piece about creativity, and the results of that choice, seem very powerful to me. One more thing to say about all of this, the theme that runs through this post is listening to Spirit. As I truly believe that, fundamentally, everything is connected in some way. When there are ‘coincidences’ or when things happen on an anniversary, I take it as a message from the “Great Whatever” to pay attention. The plan is to tell my story through a series of posts about my art. Each of these works tells a piece of the story of how I have gotten to where I am today. Look for the next post in this series at the new moon in January. It will be about “Finding the Patterns in the Puzzle of Life”. 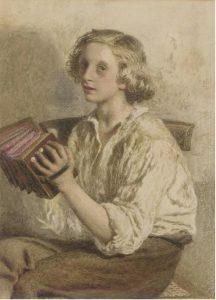 (1) Miki Raver, listen to her voice, Women of the Hebrew Bible, (Chronicle Books, 1998), 25. My story begins with a piece that was finished in 1989, nearly 25 years ago. I was truly honored Saturday evening November 3, when I found out it had been awarded ‘Best of Show’ for the Proud Past portion of the Seattle Weavers’ Guild 75th Anniversary art show. 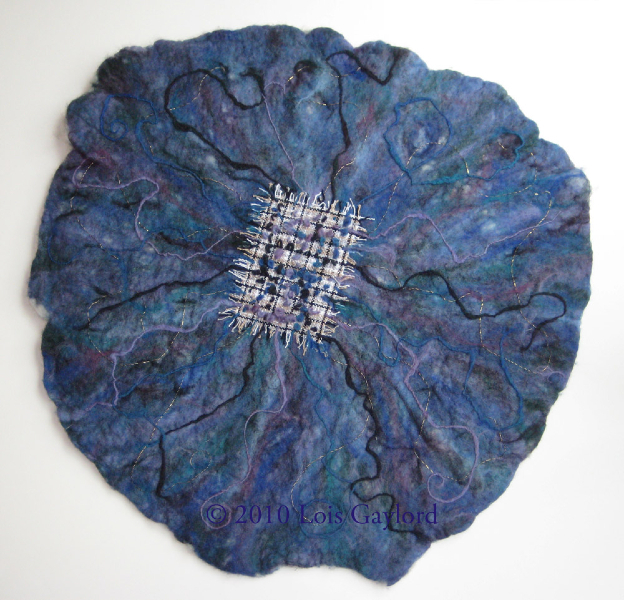 The show, sponsored by SWG is called “Putting the Art in Fiber Art, Proud Past, Dynamic Future, is at the Art/Not Terminal Gallery in Seattle, WA through November 27th, 2012. This piece was inspired by a quote from the book The Turning Point by Fritjof Capra, 1982, “The image of the Goddess…with the one manifest in the many and the many dwelling within the one”. If memory serves, this was my first introduction to the concept of a feminine Divine energy, and the Gaia hypothesis — the earth as a single living organism. Using modern physics as a basis, the book examines the many ways that everything is connected. My intent was to create a visual image or representation that showed the spark of divine light within each of us as separate entities and yet together they create a greater whole. There is a lot of personal significance for me that this particular piece was chosen for the award. “Gaia, the One and the Many” was the last piece of conceptual art I completed for almost 20 years, but was never shown publicly. In many ways it was a foundational work for me. This piece was more complex than my earlier work in concept as well as utilizing more elements and techniques. It was the first exploration of my personal philosophy that everything is connected in some way. And it shows the beginning of my now deep connection with the Divine Feminine. The timing is significant as well. I love the “coincidence” that an artwork about the “Goddess” was awarded best of show now that I am truly launching my ceremonial cloths business, dedicated to imbuing cloth with sacred intent. The next post in this series will fast forward about 20 years (with a brief stop 9 years ago) when my need to create art finally re-asserts itself.